The Levante is the current darling of the Maserati lineup, with the luxury SUV helping to double sales numbers for the Italian marque. 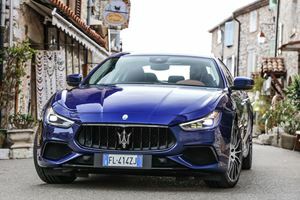 But for those that still favor sedans over trucks, a position that’s becoming increasingly unpopular, the Maserati Ghibli offers something that nothing else in its class can: emotion. The German Big Three are so far beyond the competition, Maserati is fighting an impossible battle. That doesn’t mean you shouldn’t spend some time with one before choosing yet another Teutonic nameplate for your next ride. On paper, the Ghbili is outclassed in most areas. But after spending a few days in the pre-pre-facelifted Ghibli (black paint) when visiting Israel to test drive the Levante and again in the pre-facelifted model (white paint) when giving the Quattroporte a spin around the Holy Land courtesy of Auto Italia, we returned to the US pining for more Maserati time. We missed its sweet-sounding exhaust note, honed to perfection with the help of Ferrari. We missed people smiling and nodding in appreciation at its Italian curves. Anything else in the Ghibli’s class looks ordinary by comparison. But, mostly, we missed the way it made us feel. Despite its flaws, and there are quite a few, one thing it has in abundance and which its rivals lack completely is charm. The good-looking, smooth-talking Italian has a real presence. It’s just a pleasure being in its company, whether that’s behind the wheel, as a passenger or passerby. 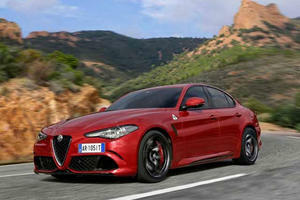 Maserati upped output of the 3.0-liter twin-turbo V6 Ghibli from some 325 horsepower to 350 hp last year. And output of the range-topping Ghibli S and SQ4 will be upped by 20 hp and 22 lb-ft of torque to 424 hp and 428 lb-ft of torque for the 2018 model, unveiled last month in Frankfurt. Throw in a 50:50 weight distribution, a proper mechanical differential and a solid chassis, and the Ghibli is sufficiently sporty to live up to the famous three-pronged badge. The extra power Maserati has bequeathed the sedan has made it considerably thirsty, however, and we managed to drain a couple of 80-liter tanks in less than 72 hours of crisscrossing the country. We’ll have to wait a while longer to see the impact the performance upgrades Maserati revealed for the Ghibli in Frankfurt last month. 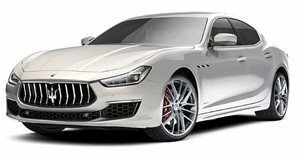 New bumpers have apparently improved aerodynamic efficiency, while the 2017 Ghibli also features electric power steering – a first for Maserati – as well as a new traction control system. 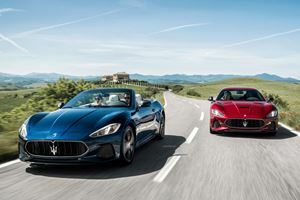 The Ghibli will also be offered in two states of trim: GranLusso (first unveiled in China), focusing on luxury, and GranSport, featuring a sportier facade and cabin. The hydraulic set-up we experienced was accurate, enabling us to place the Ghibli, despite its considerable girth, with consummate ease. Alas, electronic power steering is all the rage. We just hope the one truly outstanding feature of the Ghibli isn’t compromised as a result. Thankfully, the slick eight-speed automatic gearbox has been left alone, another superb feature of the stylish Italian with its rev-blending blips that seem to be a feature of modern Maseratis. The Ghibli’s cabin has enough quality about it to make you feel like you’re riding in a $70,000 car (the Ghibli starts from 590,000 shekels in Israel, which is closer to $170,000). The frameless doors add a touch of class, there’s plenty of leather trim and comfortable, electronic seats. The 8.4-inch touchscreen display is easier enough to decipher, with steering-wheel-mounted buttons and a rotary dial controller on the center console providing alternative means to access the system. Apple Car Play and Android Auto, a glut of safety features, rearview camera, and a choice of Harman Kardon or Bowers & Wilkins audio systems also form part of the package. The Ghibli is a five-meter car, yet rear passengers don’t really feel the benefit of that, nor does the boot provide as much space as you’d expect. At least the kick-activated trunk means you don’t have to use your hands to open it. But if you’re the head of a family of four, children up to teenage years will be more than satisfied being chauffeured around in the Ghibli. And as long as you keep it in Sport Driving Mode, you’ll be happy to do the driving honors. So before you mindlessly opt for the BMW 5 Series, Mercedes E-Class or Audi A6, do yourself a favor and spend a couple of days with the Maserati Ghibli. Forget what you might have read about the car. We guarantee that the combination of style, sound, the amazing engine, and how it will make you feel will make you think twice about going German again. Tata Motors has managed Jaguar Land Rover wonderfully. Could it do the same with Maserati and Alfa Romeo?